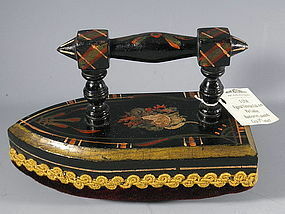 An unusual Victorian hand carved and painted with a deep red velvet cushion pin cushion. A lovely piece of Folk Art, it is shaped like an iron and is in excellent condition showing very little wear. Measures 5" high x 6.75" long x 3" wide. Country of origin is unknown, but may be Celtic. Circa 1890.